George Buck's General Merchandise Store, circa 1910. Solon Ellis, Johnny Knutson, Marian and Frieda Weare in foreground. Courtesy William Finnigan collection. As more buildings were built in Noxon, the nucleus of a town began to take shape on the level area south of the depot that bordered the NP railroad tracks. A few buildings already occupied the gentle slopes, such as those alongside the wagontrail dubbed Pilgrim Creek road. Stores, saloons, hotels, stables, and a few homes began to make the little clearing in the forest take on the look of a town. The main street was a two block long area across the dirt road from the railroad depot: Hayes store at the east and Buck's store at the west. Walkers cabin-saloon was further east up on the hill where the new school, some little distance beyond Walkers, proclaimed the settlers confidence and pride. "I explained to you some time ago that the company owns all of the land at Noxon and that there has never been any town site platted there. A number of people have put up their buildings on our right of way. To relieve the embarrassment of the situation you authorized me to have a small town site platted there. Such has been done, and the plat is enclosed herewith, for execution. I have made the town site about as small as it is possible to do so, as there is no likelihood that there will ever be a town of any size at Noxon."1. As town sites go, it was very small; about a half mile square. However, NPRR recorded it at Sanders County courthouse in January 1909. And the streets were named and lots were quickly bought up by optimistic settlers. The little town also had the newly arrived U. S. Forest Service. Years before that government entity's arrival, homesteaders and timbermen brought the sounds of sawmills and lumberjacks; their hubub quickly absorbed by the vastness of surrounding forests. The streets were still only forest or filled with fire-blackened stumps. But on the paper platt, the names were neatly lettered, giving one small victory to the merchants. Fresh white paint soon embellished Hayes Store, Finnigan's Saloon, Maynard's Saloon, and Baxter's Hotel. Boardwalks and paint also were soon features of Clark's Hotel and Buck's Store. The town had no church. Occasionally a preacher came to Noxon by train, and stopped to speak in the schoolhouse surrounded by trees on the rise at the eastern border of the plotted town site. There were a few cabins scattered between there and Main Street. With Weare's Posts and Poles Store, Buck's General Store and Hayes Store, settlers had their choice not only of what they wanted to buy, but also who would benefit from their trade. The women who settled in the area brought with them a wide variety of customs. Architecture in Noxon was influenced by their need to reconstruct on this frontier the homes they had known 'back home'; wherever back home might be. Civilization was entering the valley. No matter a man's occupation, he couldn't help but notice windows that displayed lace curtains. And crocheted doilies graced tables and the arms and backs of sofas in even the most modest livingroom. Who designed the houses, or why these particular architectural designs were selected for carpenters like Frank Perrott to build, is lost to history. In the block west of Buck's General Merchantile Store, the Huffman's moved into a house built by Parrott on main street at the west end of town. Halfway between Buck's store and the Forest Service compound, it fronted Pilgrim Creek road. Saint's Stables occupied lots south of Huffman's. Parrot built also built a house south of Saint's Stables that was probably the first house in Noxon with a hip-roof. On the west side of Pilgrim Creek road, about across from the hip-roof house, Huesteads and Hamptons were the owners of two small houses south of and adjacent to the Forest Service compound in Noxon. Charlie Mercer later bought Huffman's house and then distinquished it from all other houses in town by coating it with bright pink stucco. The lot east of his was designated Noxon Park. Saint situated his tall, narrow frame 30-foot long building closer to the alley-street that ran south from main street between Pilgrim Creek road and a block of lots in town. Transients without the price of a room in the hotel occasionally slept in the stable's loft. Earl Engle took German-born Katie for his bride and they prospered sufficiently, to 'graduate' from a log cabin on the Rock Creek Meadows and move into the frame house Parrot built south of Saint's Stables. Ray Meadows built Evert and Minnie Jenkins' house next to the two small cabins west of Mrs. Saint Clair's Cottage Rooms. Jenkins' two-story frame house sported a broad veranda across the front that provided comfortable rocking-chair views of activity along Main Street. A short distance north of this growing activity, out beyond sawmill that occupied some of the acreage of flat meadow land, the Clark's Fork River swirled against its banks. And every year throughout spring and into summer it carried log drives small and huge toward Idaho markets. During winter ice often made the ferry crossings impossible. ﻿﻿﻿﻿﻿﻿﻿Ethel Baxter Weare brushed her brunette hair into an attractive bun, tied an apron over her long dress, came downstairs from her living quarters above the store and took over the operation of the Posts and Poles store while her husband was logging or working in his sawmill. Lucy Jenkins, now grown into a sweet auburn-haired teenager at Heron, came to help; board and room being a part of her pay. About a quarter of a mile east of the school and also on the southside of the road into Noxon, Divers built a big two-story rooming house with a dozen rooms in it. Schoolteachers and a few woodsmen made up most of its clientele. In July 1912 the time seemed ripe for Reverend John Lang of Pittsburgh, PA who arrived in Noxon and assumed charge of the newly organized Presbyterian church. The two teachers for the 1912-13 term were Charles DeNoyer, who received $90 a month plus $10 for janitorial services, and Miss Hattie McDonald, whose salary was $75. 2. That fall while Rev. Lang began reaping souls for God, one of the heaviest crops of hay was harvested, although some of the clover was lost through inability to get it put up. And some of the souls were lost through Rev. Lang's impotence to reach them, try as mightily as he could. However, Miss MacDonald taught such an exceptional class at Noxon they carried away the $10 pennant awarded as first prize for the best school exhibit at the Sanders County Fair, held ninety-miles upstream at Plains.2. 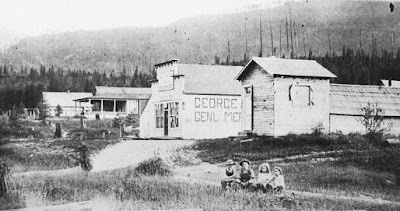 On November 7, 1913 George Buck became the post master at Noxon where he handed out mail in his store "200 feet south of the Northern Pacific railroad track, 1/2 mile from the Clark Fork River on the south side."3. "B. B. Bunn celebrated our Nation's birthday in Clark Fork, Idaho. The very idea! As though Clark Fork compared with Noxon; as though Idaho compares, in any way, with Montana. Of course B. B. had business in Clark Fork; but has he not business in Noxon? ; in Sanders County? When will that 'piker' learn to stay at home and attend to the thing near at hand realizing that the thing near at hand is always of first importance? ... The 4th of July celebration in Noxon was unique in the extreme, especially the color scheme in the decorations ... it was a modification of an idea gained at the National G.A.R. encampment in St. Paul in 1896 ... a flag of wild flowers, but the arrangement was not complete ... The 4th celebration seemed to accomplish an end which all patriotic celebrations aim to accomplish - the teaching of civic righteousness, honor and heroism." "After spending last week inThompson Falls and going from here to Clark Fork, Charles DeNoyer of Noxon was placed in charge of the county officers at that city, it being claimed he was the victim of acute mania. "Mr. DeNoyer is well known in the west end of the county, having taught school at Noxon for the past year...he has many acquaintances who will regret to hear of his affliction." "Charles DeNoyer spouted Shakespeare, Bryan's 'Cross of Gold' speech and recited ancient history. He said he would leave the jail 'disguised as a bunch of radishes'." DeNoyers family came to take care of him. His students missed him and he was considered to be as fine a teacher as Noxon ever had.4. One man summed it up by saying DeNoyer was a fine fellow who just read all the time until reading finally burned his brain out. As geese winged in "V" formations over the valley frosty days heralded the approach of winter snow when Joe Hammons moved to town in November. Bill Finnigan began repairing the Boomer Hall that had served the community as a gathering place and dance hall, with the intention of converting it into a rooming house. Mrs. St. Clair acquired it and made it into rooms to let, naming it "Cottage Rooms." The two hotels and the Cottage Rooms 'down town' were frequented more by drummers, tourists, land seekers, the train crews and all the variety of transient population that moved through the valley. for a dance hall. Courtesy William Finnigan collection. ﻿ Charles Maynard got the second car in Noxon. John Beal, who had the blacksmith shop, was now occasionally called on for automobile work. Then, in November 1914, Beal sold his blacksmith shop to Mr. Brady, Buck's celebrated the installation of a gasoline lighting system in their store, Marion Larson, "our horse dealer", donned his mackinaw, took his customers out to the barn, nibbled on spears of hay, chewed the rag, and sold two horses the same week. Don Maynard went to Clark's Fork and bought a horse for $75 from a man who had passed through. The newspaper also informed their readers that Mr. Divers stood in his lumber yard, and with deadly aim, killed a deer on the opposite side of the river 200 yards away. Henry Larson and Mr. Garred were invoicing at Peek's Store at the end of the year because operation of the store would be changing hands. Peek's Hall, the large open room upstairs over the store, was gaily decorated for the Christmas night ball. In the Bull River valley yellow lamp light spilled from the windows onto the snow shrouding sturdy log cabins. Helen Berray was joyfully decorating the tall red-fir tree brought to them by her brothers, Frank and Algie. She said, "Mother baked cookies and cut them like boys and girls to hang on the tree. Father drew stars and crescents on cardboard so they could be colored, or covered with pretty candy wrapper that had been saved up, and hung on the tree. He'd fit a piece of match stem or a little piece of wood into walnuts so they could be hung; and small red apples. Mother cut out paper dolls and showed us how to make paper chains of some colored paper, or if it was possible to have some colored pencils, to color them. We also strung popcorn and cranberries on heavy thread and made chains to wrap around the tree. Mother made taffy for a taffy pull. We'd have a little get-together and the neighbors would come. There weren't any gifts as no one could afford them."5. Jude Fulk Johnson acquired Charlie Maynard's pool hall in January 1915, shoveled snow away from the front windows almost every day, and turned it into a restaurant. One Sunday night a great deal of excitement but little damage resulted when a gaslight exploded in the restaurant. A short while later Jude turned the restaurant over to Gages who soon let Mr. and Mrs. Arthur King have it. It closed shortly thereafter. Collogan sold two sleigh loads of hay from his ranch on Bull River to George Buck, the storekeeper, exchanging them for groceries. Noxon stores operated on the barter system most of the time. Post makers and ranchers bought on credit. When their materials were ready for market, the storekeepers 'bought' them and then sold them, taking a profit for themselves. Rarely did the settlers market more than enough to pay off the bill they had run up.6. After a considerable wrangle with the railroad land agent, Clifford Weare had to move his buildings in Noxon, including his store. After the land was surveyed the NPRR ordered him off their land, so Weare moved his buildings onto a lot near his mother-in-law, Mrs. Baxter's Noxon Hotel.7. As the outlying settlers began making it into town to do their spring shopping they noted that Mrs. Baxter had closed her hotel and moved up Pilgrim Creek onto her ranch; Gage had reopened the Noxon restaurant; and Marion Larson had packed his trunks and left Noxon again. "For good", he said. Garred was back and operating the store in Marion's stead.8. Marion didn't stay away long. He returned and married Madelaine Brown. His wandering was finished. Spring rains fell in April and May, drawing out the winter frost and making it possible to tackle the water problems at the Noxon schoolhouse. The waterline to the little schoolhouse had frozen up during the winter so, after the gravel soil thawed in May, Jim Finnigan began digging up the old pipe with an aim to put it deeper. He also put a drain pipe in the same ditch.9. Most of the townspeople gathered on the riverbank on a mid-May Saturday to watch the spring log drive as it flowed past the tiny community. Millions of logs filled the river; the accumulation of the winter logging camps from upstream. Shouts from the logdrivers mingled with the cheers of the onlookers as the drive sped downriver. The log drive would be days reacing the Idaho sawmills on the shores of Pend Oreille Lake.9. 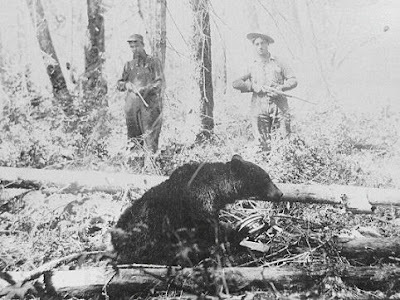 Unidentified bear trappers at Noxon in early 1900s. Courtesy William Finnigan collection. An ice cream social was held at Noxon the Saturday night following the big log drive "for the purpose of buying some new records for the school Victoria." A box of chocolates was given to the most popular young lady. Everyone came. Receipts were $32.90 with a net profit of $13.00. Thanks were given publicly to the ladies who brought the cakes. No one recorded the winner of the box of chocolates.10. One of the most exciting topics that evening was Glen Dodge's experience with a bear. Dodge had been living in a tent camp on his homestead near Smeads. A bear went through the tent taking some blankets outside and scattering them around. He set a trap and in a short while had caught the scavenger and had plenty of bear meat and was rendering lard.10. 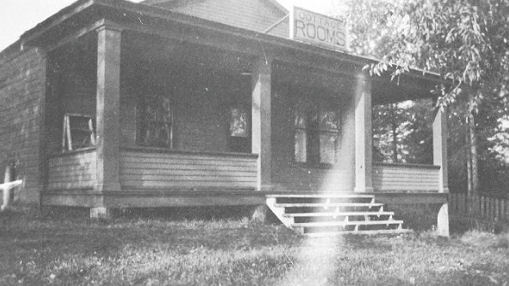 Noxon's ever changing business community included Finnigan's acquisition of the Cottage Rooms in May 1915. The name changed to 'Finnigan's Rooming House' and Mr. and Mrs. Gage took their cooking talents from the restaurant to serve meals at Finnigan's. Garred moved out of Noxon and Rollo Older worked in Peek's Store until Henry Larson, Marion's brother, arrived on July 1st to manage it.10. Decoration Day was approaching and with it consciousness of the condition of the cemetery heightened. The annual work day to clean it up provided the opportunity for a community dinner served by the ladies of Noxon in the Baxter Hotel for the men who cleaned the cemetery. With this tantalizing incentive, nearly every man pitched in willingly to do his bit.11. "Rev. M. Lang has resigned his position as pastor of the Presbyterian church here. The church has been mainly supported by the Board of Home Missions of the Presbyterian Church, but the European war has caused a deficiency of funds and this church has lost it's support, hence Mr. Lang's resignation. Mr. Lang has made a number of friends here who are sorry that he will be compelled to enter another field. Mrs. Lang is the primary teacher in the Noxon school." "This speaks well for the teachers and the pupils of the Noxon School. To win first and second prizes in language essay contests when the thousands of school children in the great state of Montana are in competition is certainly something to be proud of."12. Noxon's main street took on a new air in October when 'Dutch 'Frank' finished painting Peek's Store in Colonial yellow trimmed in tobacco brown.13. Chocolate and cocoa - Walter Baker Co. Wheat and flour - Pillsbury Milling Co, Minon, Min. Products were offered by many companies hoping to influence young minds to be aware of, and desirous of, their merchandise. Teachers were not restricted from utilizing them in any way they wished as teaching aids. In many cases these, combined with the use of the states maps and the world globe, became history-class teacher's aids. And pupils who had no exposure to much that was not native to these timber-laden mountains gained awareness of a world outside the boundaries of the mountains. Someday they might ride the train beyond the valley to see for themselves cotton and papaws and marble quarries.14. Religion was gaining stronger support in the community with Mary Knutson and Fanny Hampton among those wanting their children to follow Christian ways. In November the Sanders County Sunday School convention was well attended with members from all of the outlying communities.15. However, with the Presbyterian minister and his guiding influence gone from the town groups underwent changes. In December the Noxon Lyceum, a literary society, was organized. The name was quickly changed to the Noxon Civic League. Their regular meetings were held every other Friday evening. The Blue Ribbon Literary Society of the Noxon School was organized. It met on the intervening Friday afternoons. The Christian Endeavor group was also organized in December of 1915.16. The newspaper reported that the Christmas program, "rendered by the Noxon public school last Friday evening was one of the best ever given in Noxon. The house was packed, some even standing in the belfry. Beginning at 7:30 p.m. the program lasted until 10:50. By 11 p.m. everybody was enjoying a treat of candy, nuts and oranges and 217 stockings of candy were distributed." A special feature of the program was a 50-minute play, 'That Rascal, Pat'. "Instead of a large Christmas tree, a fireplace and family size tree were brought onto the stage, preceding the last two numbers on the program. Hanging from the mantel were two stockings made of mosquito netting, displaying their contents of candy and nuts. On the opposite side of the fireplace from the tree stood a large red stocking, too heavy to hang, which contained the treats of the evening. "The school wishes to extend thanks to those who so generously contributed to the $40.25 raised, to those who gave their assistance in making bags and stockings; to the good housewives who so kindly loaned us rugs to use on the stage; to Charles Knutson for not only lending us lumber for the stage, but also delivering it; to those who brought sheets for back and side curtains; and to Charles Knutson and Mr. Rhinesmith for taking an active part in the program, without whom the entertainment would not have been such a success." Eleven-thirty found most of the merry-makers in Peek's hall lost in the giddy whirl of the dance at the Christmas night ball. Cedar wreaths, bright ribbons and lamplight lent a festive air to the midnight supper of cakes and sandwiches. Both the Noxon stores were soon busy taking inventory. "Noxon has two stores that a town of this size should feel proud of," wrote the editor of Sanders County Independent Ledger at the end of 1915. Since Peek's and Buck's stores were both doing well, it's possible Weare's Posts and Poles store had burned down by then. Weare had moved his family onto their homestead on the north side of the Clark's Fork, had sold his sawmill and was engaged in logging camps. December 30, 1908 letter, Minnesota Historical Society – NPRR files. Sanders County Ledger, July 11, 1913. Nation Archives – U.S. Postal Service. Helen Berray Kirschbaum, tape-recorded oral history. Sanders County Independent Ledger, March 26, 1915. Sanders County Independent Ledger, April 23, 1915. Sanders County Independent Ledger, May 14, 1915. Sanders County Independent Ledger, May 21, 1915. Sanders County Independent Ledger, June 8, 1915. Sanders County Independent Ledger, October 15, 1915. Sanders County Independent Ledger, November 12, 1915. Sanders County Independent Ledger, December 31, 1915. Sanders County Independent Ledger, December 10, 1915. The $40.25 was for: Candy, $20.55; nuts, $9.70; oranges, $6.30; mosquito netting, thread and yarn, $3.40; nails for stage, ten cents; dye, twenty cents. "Left over, eight yards mosquito netting, half skein of yarn."